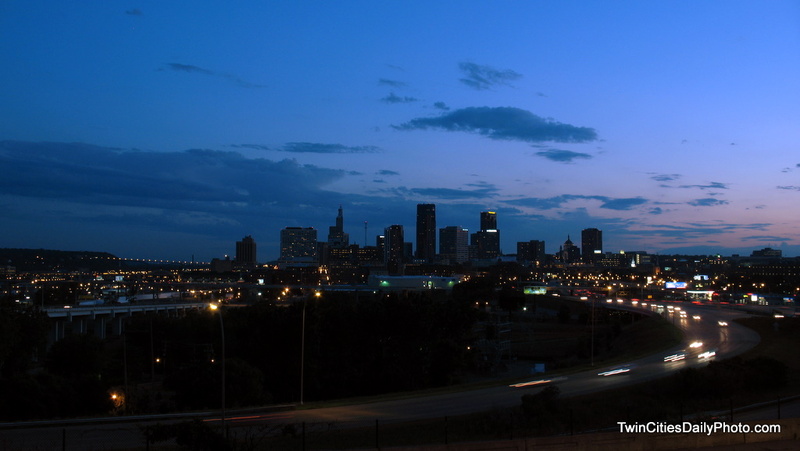 With today being the 1000 post for Twin Cities Daily Photo, I decided it would be fitting for today's photo to be be from one of my personal favorite subjects to photograph....the St Paul Skyline. I've actually been sitting on this photo just for this occasion, as I took this one about two weeks ago. The location for this shot is from the East Side neighborhood. I'm between 3rd Street and 7th Street on the elevated sidewalk. It allowed me to be above the treeline and a clear view of St Paul. Congratulations! Reaching 1000 is a real milestone and you chose a perfect photo to celebrate it. The Big 1,000, congratulations. I like all the CDP community know how much effort and thought it takes to get to that number. I have a friend living in St Paul, so I do drop by. Congratulations on your 1000th post! That is such a great achievement, and you took a fantastic photo to celebrate it with! So sorry I missed your big day. Am going thru a lousy bout of bronchitis and only today am beginning to feel human again. Hey, Congrats on 1000 posts. I'm looking forward to the next thousand!